The wall keg is 1" x 1/4" thick. 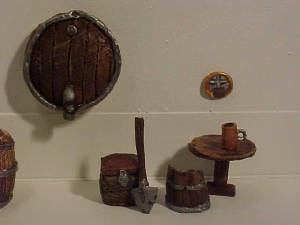 The beer mug is1/4"tall x 5/16"round. A door for the strong hold. Tanned dragon hide is hard to beat. Aye a nice soft leather seat to sit on. 5/8" tall x 5/16" wide 9/16" seat. Here is a sleeping Dwarf on a barrel bed. I even made a hole in the covers, see his toes. It can be used for anything you want. 3 pieces make it up. Used by Dwarfs and Men to power machines. 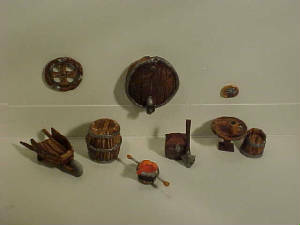 You will get, 3 barrel chairs 1/2" tall x 1/2" round x 3/8" to seat, 2 large barrels 13/16" tall x 3/4" wide tapers to 9/16", 1 gold cart 9/16" tall x 1-5/8" long x 5/8" wide, 1 shovel 5/16" wide tapers to point x 3/16" round handle 3/4" long, 2 tables 5/8" tall x 3/4" round, 1 extra large flush mount wall keg 1" round x 1/4" thick, 1 treasure chest 3/8" tall x 3/8" wide x 1/2" long , and assorted beer mugs 5/16" round x 1/4" tall, 1 window dressing for the mine or Karak 3/4" round, and for the unwated guests to your KARAK GOLUGUL 1 small smelting pot full of molting steel 3/8" tall x 1/2" round tapers to 3/8" handles stick out 3/8" on each side. Any Dwarf hold would love all this. Oh! also the Dwarf Icon on the wall 3/8" round. This Dwarf strong hold door is covered in tanned dragon skin. A wood door with steel straps covered in dragon hide. 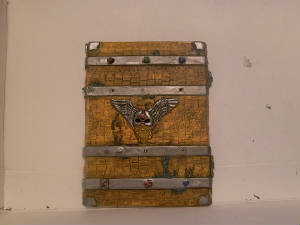 It has gem bolt covers and a Dwarf icon in the center. Also in the lower left is the door knob for those who dare to enter. It measures 2 5/8" wide x 3 3/8" tall x 1/4" thick. Just a simple little chair for a Dwarf to rest his old bones. As soft as limestone, the leather is. Smaller than other human size chairs it works well with 25mm, 28mm, and 30mm characters as a Dwarfs chair. This item is priced at 1.50 each. This is a place for a Dwarf to lay down. It is a bed made from a old beer keg, cut in half long ways. The covers have a hole in them, and the pillow is up a little due to his other arm underneath. The size is 1" long x 3/4" wide 1/2" high. The round high volume tank looks like hammered copper. The smoke stack has some small details on it like the trim on upper rim, and the door to the fire box. 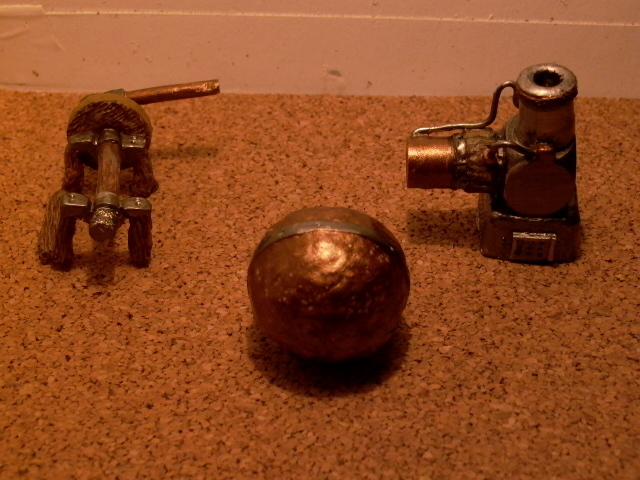 Also each line for the brass piston barrel is a seperate piece. Joining these two is a area of wood slats that have steel straps holding them in place. It is compact but fits both human, and Dwarf armies. A Dwarf has to defend his ale. 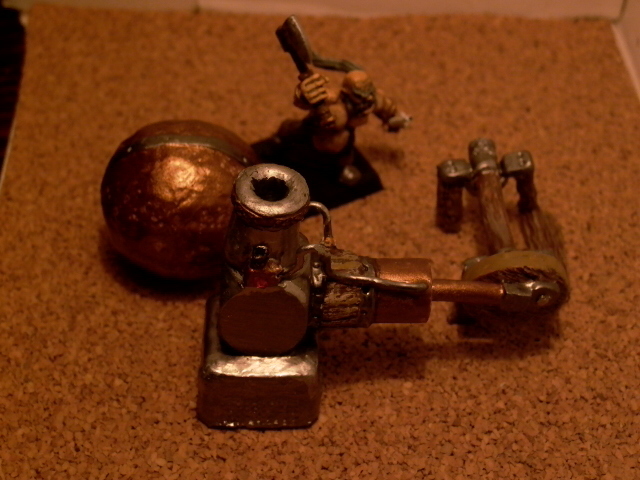 Many of the other kits, like town stuff will work with the Dwarfs well. You can use the stockpile of goods almost with any race in middle earth.